(BOSTON) — Researchers from Boston Childrens Hospital, the Wyss Institute for Biologically Inspired Engineering at Harvard University, the Harvard John A. Paulson School of Engineering and Applied Sciences (SEAS), and the Karp Lab at Brigham and Womens Hospital have jointly designed a specialized catheter for fixing holes in the heart using a biodegradable adhesive and patch. As the team reports in Science Translational Medicine, the catheter has been used successfully in animal studies to facilitate hole closure without the need for open heart surgery. Catheterizations are preferable to open heart surgery because they don’t require stopping the heart, putting the patient on bypass, and cutting into the heart. The Heart Center at Boston Childrens is committed to pursuing the least invasive methods possible to correct heart defects, which are among the most common congenital defects. To truly realize the patch’s potential, however, the Boston Children’s/Wyss/SEAS/Brigham and Womens research team sought a way to deliver the patch without open heart surgery. Their newly designed catheter device utilizes UV light technology and can be used to place the patch in a beating heart. The clinician then deploys the patch and turns on the catheters UV light. The light reflects off of the balloons shiny interior and activates the patchs adhesive coating. As the glue cures, pressure from the positioning balloons on either side of the patch help secure it in place. “This really is a completely new platform for closing wounds or holes anywhere in the body,” says Conor Walsh, Ph.D., contributing author on the study, Wyss Institute Core Faculty member, Assistant Professor of Mechanical and Biomedical Engineering at SEAS, and founder of the Harvard Biodesign Lab at SEAS, and author on the paper. 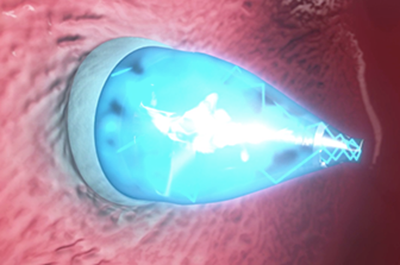 “The device is a minimally invasive way to deliver a patch and then activate it using UV light, all within a matter of five minutes and in an atraumatic way that doesnt require a separate incision. SEAS/Wyss Institutes Ellen Roche, Ph.D., co-first author on the paper, along with Boston Childrens Assunta Fabozzo, M.D., adds that the device is designed to be customizable. For instance, the rate at which the patch biodegrades can be slowed or accelerated depending on how quickly the surrounding tissue grows over it. Further studies will reveal the appropriate lengths of time for different circumstances. Jeff Karp, Ph.D., a bioengineer at Brigham and Womens Hospital and a co-founder of Gecko Biomedical, developed the glue product in his lab at Brigham and Womens Hospital. Gecko Biomedical will be testing the glue product in humans later this year. Boston Children’s Hospital (http://childrenshospital.org) serves as the connector and integrator of Harvards teaching and research efforts in engineering, applied sciences, and technology. Through collaboration with researchers from all parts of Harvard, other universities, and corporate and foundational partners, we bring discovery and innovation directly to bear on improving human life and society. The Harvard John A. Paulson School of Engineering and Applied Sciences (http://seas.harvard.edu) serves as the connector and integrator of Harvards teaching and research efforts in engineering, applied sciences, and technology. Through collaboration with researchers from all parts of Harvard, other universities, and corporate and foundational partners, we bring discovery and innovation directly to bear on improving human life and society. Brigham and Women’s Hospital (BWH) (http://brighamandwomens.org) is a 793-bed nonprofit teaching affiliate of Harvard Medical School and a founding member of Partners HealthCare. BWH has more than 4.2 million annual patient visits and nearly 46,000 inpatient stays, is the largest birthing center in Massachusetts and employs nearly 16,000 people. The Brighams medical preeminence dates back to 1832, and today that rich history in clinical care is coupled with its national leadership in patient care, quality improvement and patient safety initiatives, and its dedication to research, innovation, community engagement and educating and training the next generation of health care professionals. Through investigation and discovery conducted at its Brigham Research Institute (BRI), BWH is an international leader in basic, clinical and translational research on human diseases, more than 1,000 physician-investigators and renowned biomedical scientists and faculty supported by nearly $600 million in funding. For the last 25 years, BWH ranked second in research funding from the National Institutes of Health (NIH) among independent hospitals. BWH continually pushes the boundaries of medicine, including building on its legacy in transplantation by performing a partial face transplant in 2009 and the nations first full face transplant in 2011. BWH is also home to major landmark epidemiologic population studies, including the Nurses and Physicians Health Studies and the Womens Health Initiative as well as the TIMI Study Group, one of the premier cardiovascular clinical trials groups. For more information, resources and to follow us on social media, please visit BWHs online newsroom.